Lunch @ Les Fontaines Blanches (61 Promenade du Festival): This kids indulged in Linguini Carbonara (EUR 14.50) and delicious Crèpes Banana & Nutella (EUR 5 per 2). We decided to split a Gratinée à l’Oignon, French onion soup (EUR 12), as a starter. A wise choice as the portions here are big and they weren’t skimpy on the cheesy bread either. 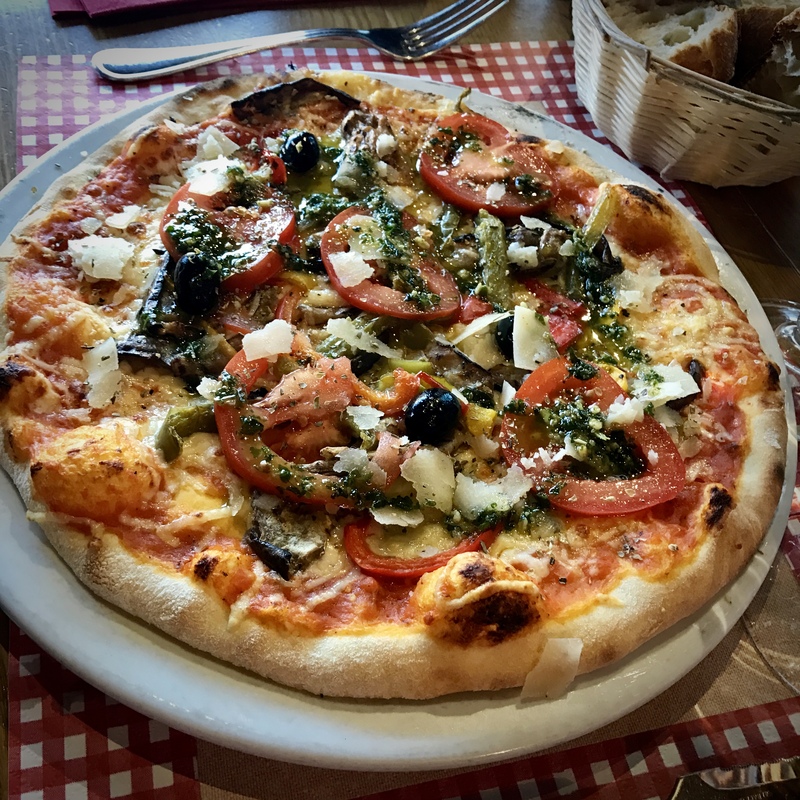 As a mains, Chantal had a Pizza Végétarienne (EUR 12) loaded with grilled vegetables and pesto which was very nice too. I had their Maxi Burger (EUR 22). 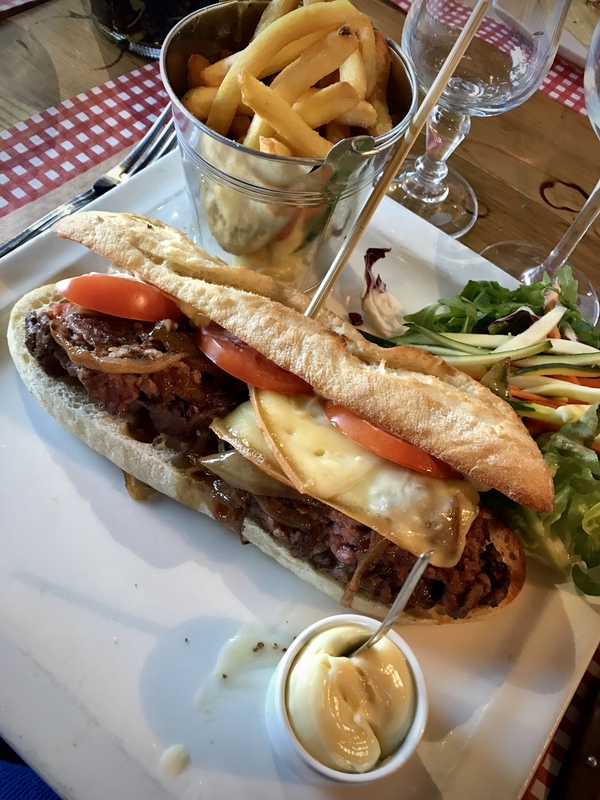 A classic French presentation: a huge, juicy burger on a baguette, red wine braised onions, mustard mayo and slices of raclette cheese. Fantastic, but this late lunch was sufficient to skip dinner! 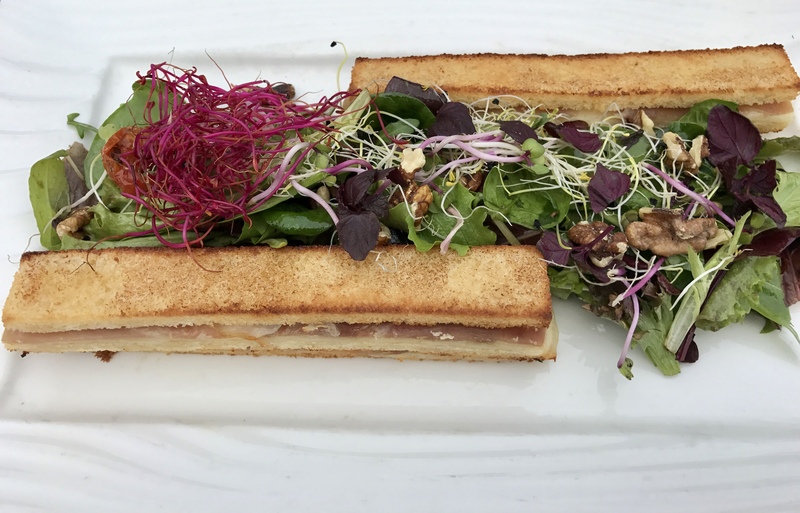 Lunch @ Le Bistro (Place Centrale): Risotto à la Truffe (EUR 28), Croque Montagnard (EUR 16), a stylized version of a Croque Monsieur with Salad as well as Crozets au Fromage (EUR 22), which basically is a local Mac ‘n Cheese made from buckwheat pasta, topped with Beaufort cheese and strips of dried ham. The current Avoriaz resort was built in the early 1960s for the Pierre&Vacances group and was one of the first resorts to deliberately depart from the mainstream design of colossal concrete housing, adopting an unique architectural style trying to integrate into the mountain scenery and an abundant use of wood. Lunch @L’Epicerie (Quartier de l’Amara): The BMA Burger (EUR 20) with Farmer’s Bacon, Abondance cheese and a fried egg, Gnocchi in a creamy Mushroom sauce (EUR 18). The desserts were: Double Crème (EUR 8): Fromage Blanc with Myrtilles compote and meringue, a Tarte Myrtille and a Chocolate cake (EUR 7,50 each). Fromage blanc is a smooth type of cottage cheese and myrtilles are often called blue berries, but are in fact bilberries, the European kin of the North American blueberries. A delicious combination! Dinner @Le Douchka (Quartier la Falaise). 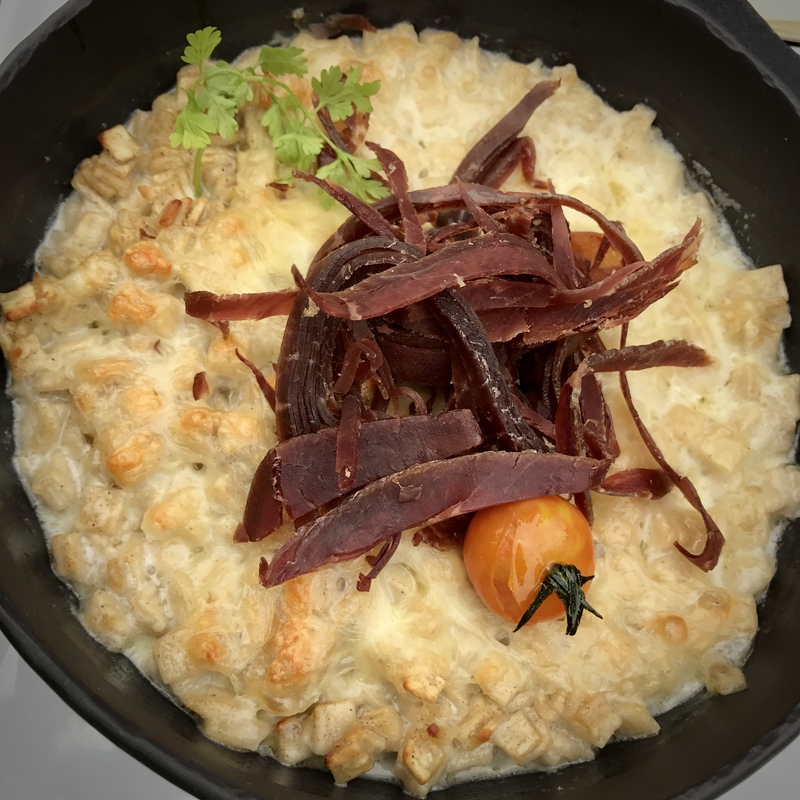 No ski trip is complete without it, Fondue Savoyarde 🧀 : cheese fondue with white wine that is eaten by dipping morsels of stale bread in a bubbling sea of cheese (sometimes also accompanied with an assortment of dried meats, and pickles like cornichons and pearl onions). We tried 2 types of Fondue Savoyarde. On the left the Fondue Moitié-Moitié (EUR 20 per person), designating that it is 50/50 mix of cheese(s). Also known as Fondue Suisse, in the Savoie region this is usually half Beaufort and/or Comté and half Emmental de Savoie. 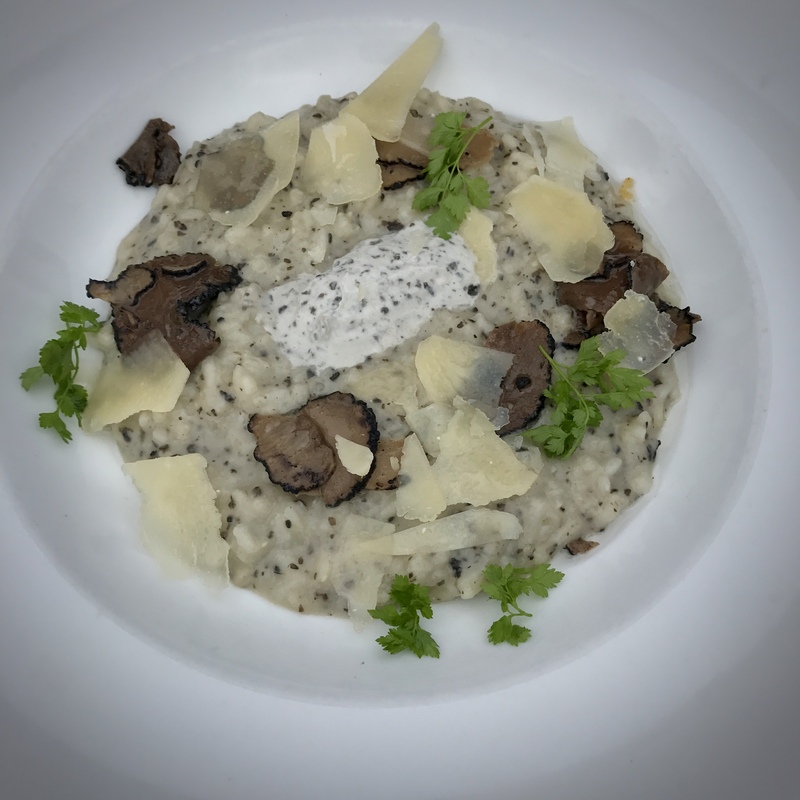 In Switzerland, it is usually Gruyère and Vacherin Fribourgeois. Both are delicious! On the right the Fondue aux Cépes (EUR 23 per person) which came with the addition of porchini mushrooms. The consistency of the larger mushroom pieces became a bit tough over time, but I nevertheless liked the somewhat robuster and earthier flavour of this cheese fondue.